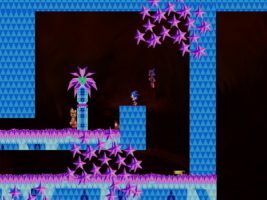 Sonic Souls – This is the kind of game I feel like I can’t be too harsh on. Clearly, this is the work of somebody who is very passionate. There’s a lot of stuff to play around with here, more than I’ve ever seen in any other Sonic GDK project to date. But this is also something quite clearly made by somebody who is still learning, and still experimenting. That’s not inherently a bad thing, but it does mean that Sonic Souls is kind of a rough game to play. I ended up getting frustrated when I got to the Sky Fortress level, where a poor framerate (even on the lowest settings) caused a grind rail to break and throw me in to a death pit every single time. There’s something to be said for having forward momentum in game design and not getting hung up on your mistakes, but they’re mistakes just the same. 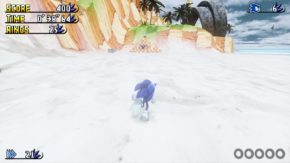 Sonic Souls features a lot of quantity but not enough quality. Never stop learning. Dash Cats – I think it is very easy to underestimate how much work needs to go in to making an original game. 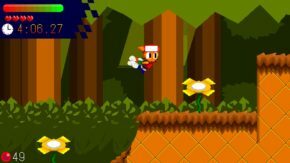 SAGE is largely focused on fan games, which by and large use the aesthetic stylings of Sega’s official Sonic games, and often use graphics ripped directly from those games. But what do you do when you’re on your own? When you can literally do anything you want? The possibilities can seem endless, leaving you with one big question to solve: how am I going to pull any of this off? I see a lot of myself in Dash Cats, and while I think it’s easy to be put off by the game’s simplistic graphics and sound, the actual gameplay of Dash Cats feels pretty good. Look past the clunky main menu and controller configuration, look past the bizarrely discordant original music, look past the not-quite-detailed-enough sprites, and you’ll find the heart of a good game beating at its core. 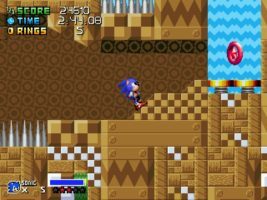 Sonic Fear 2: Metal Sonic Out of Control – I’ll level with you. This whole “Creepypasta Games” thing? Where people find old retro games like The Legend of Zelda: Majora’s Mask for the N64 and they’re secretly haunted or whatever? I don’t understand it. Especially the “Sonic.exe” portion of the Creepypasta “scene.” It’s just so stereotypical: Oh no! The main character of this famous video game franchise has turned evil and now there’s blood everywhere! That’s so mature and scary! I guess it’s just a phase we all go through, because “bloody ultra-violent retro game characters” was like a whole Newgrounds sub-genre when I was a teen. It doesn’t help that I’m difficult to scare — many horror games don’t “work” on me. So, this game, where Tails Doll turns Metal Sonic in to a bloodied Sonic.exe variant? I’m not spooked. And not having very much fun, either. It’s just difficult, and weird, and occasionally gameplay will be interrupted by a “jump scare” that is more disorienting than it is frightening. I’m sure there’s people out there who love this kind of stuff, but it’s not for me. Sonic Revolution – Quite a lot of people want to see Sonic put up his dukes, but this isn’t another M.U.G.E.N game. This is built instead using “Beats of Rage,” and as you may have already deduced, it lets users create their own Streets-of-Rage-like horizontally scrolling beat’em’up. 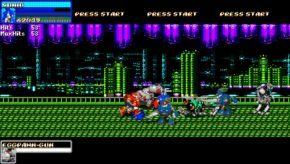 There’s a lot of characters to choose from, but as with most beat’em’ups, the action starts out fast and frenetic but eventually starts to wear a bit thin in extended play sessions. What initially looks like a big ocean is only two feet deep. Robots swarm on screen and you mash the buttons until there are no more robots left to dismantle. Move to the next area, repeat. It’s easy to lose track of your character among all the commotion, too — if you can figure out where Sonic is in the included screen shot, congratulations. Is it bad? Not at all; it’s fun while it lasts. Is it repetitive? Unquestionably. I imagine fans of this genre are used to that. Pepsi in Sonic – I’m going to risk sounding like an old man here, folks, but here’s my hot take: I think internet memes are getting out of control. Nowadays, the simple suggestion that there might be a joke is enough for people to open the floodgates of ironic pseudo-appreciation. 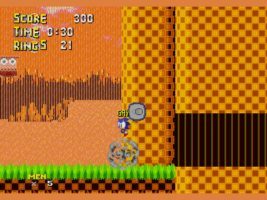 This is a ROM hack of the original Sonic the Hedgehog where you play as an animated can of Pepsi as you wiggle around collecting Pepsi logos and bopping Jimmy Neutrons to make the word “GAY” briefly appear. If you have the misfortune of breaking a Power Sneakers monitor, you’re treated to an extended voice clip of a man screaming that continues even after you die. I struggle to find the connecting tissue in all of this, but I suppose humor is a subjective topic. I just don’t understand. 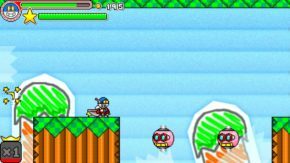 Project Spikepig – Given all of the eclectic games in this SAGE Review Slew, it’s actually fairly relaxing to come back to a game like Project Spikepig. Actually, this game seems to be pretty relaxing in general, with soothing music and a muted, low-contrast color palette. It makes for a pretty pleasant experience all around, bolstered by some nice, dense level design and just enough unique ideas to keep things interesting. There’s quite a lot of it, too; something like four or five levels are on offer here, and they’re all huge and intricate. I do have two complaints: for starters, there’s no video configuration menu, so you’re stuck with a tiny 320×240 window when it should be 640×480 or bigger. Second of all, Sonic actually has a new climbing move in this game but unless you dig through the readme you’d never know it’s there. A little more emphasis from the level design would be nice. Regardless, I’d recommend you check this one out. SQGT – This is a teaser for an original platformer, but gosh darn is it charming. There’s an undeniably fun sense of energy about everything and I really love the game’s bouncy personality. It seems to be early days yet — there’s quite a few levels to go through, but more than once I became stuck. The first time, I dropped down a pit in the first level only to become trapped in what appears to be a dead end. The second time, I actually got stuck inside of a shielded enemy and repeatedly took damage until my little robot guy died. Still, I see a lot of potential in this game, and I absolutely love how much characterization it already has. That should be enough to warrant your time. Come back tomorrow for even more SAGE demo reviews! See you then!